This journal and world started as a project with the goal of reflecting the personality and life experience of its creator by writing the journal while building and combining multitudes of inspirational sources to think and build in new ways by combining the magical, practical and profound. Values emphasized are beauty, creativity, love, playfulness and openness. The main area is named from the flower biome in which it is built. The most popular and striking feature is probably the large tree in the middle. There is also an area called the Adventurer's Hub which is fun to explore hidden within the mountain to the south-west. Its 11 builds are dedicated to forum members contributing to this thread. Surrounded by mountains, hills, a lake and a river, in the center of a gentle slope a tree grew during thousands of years. Eventually it grew so large rainwater began to collect between its branches into a pond and a waterfall began cascading along its trunk. Together with mountain streams from the icy hills in the west and another stream from the north small lakes formed south west of the tree. Under the tree and around the streams and lakes animals grazed in peace among flowers. Eventually a group of people of various backgrounds arrived and settled down. Awed by the beauty of the valley they did their best to not disturb the place. This is their story. A green L-shaped building is partly tucked into the hollow trunk of the tree. A map of the area is displayed on the wall to the right of the southern entrance. Inside is a reception desk. Here a woman named Est welcomes visitors to be housed in two guest rooms. She also maintains the building next door, a general store with a workshop on the roof, and a kitchen and general storage inside. In a three storey house with an emblematic large emerald crystal on the roof north of the tree lives a wizard called Fer. Fer brews potions in the cellar of the house, which has a farm in a small dark room, a water well, a bench and some chests with many different strange things. The main floor is only one large room full of bookshelves and chests. In the middle of the western gable of the room stands a special table where he enchants tools and other objects to give them magical properties. In the eastern gable is a small kitchen. In the smaller room on the second floor is a workbench and chests to create devices for various contraptions built in collaboration with other inhabitants of the valley. On the top floor of the house is a bed where he sleeps. The house also has balconies towards the east and west. To the east of the reception an overgrown cabin was made out of an old fallen tree is partly merged into the hill. A man named Ope eats and sleeps in it when he is not planting and cutting trees, sawing planks and doing carpentry work. Inside the lower trunk of the Life Tree, on the roof of the reception building, are chests where Fer brings the potions and enchanted tools he makes to be used by anyone in the valley who needs them. Up along the trunk are stairways leading to chests storing precious gems in the three main horizontal branches of the tree. There are two gems and chests for each branch. Each chest is connected to a glass crystal outside the branch. Whenever a chest is accessed lights are lit and a unique melody is played inside the crystal corresponding to the gem. One of the branches also has a door leading outside to a branch where a giant owl often sits to sleep during daytime. South along the hill as it steepens, past the general store is an entrance. Just to the left is a bedroom for two. Passing by the bedrom one enters a small station for minecarts. One tunnel leads north and down, then left to a large network of mineshafts. Here stone and ores are cut and brought back along the track by a man called Esh. 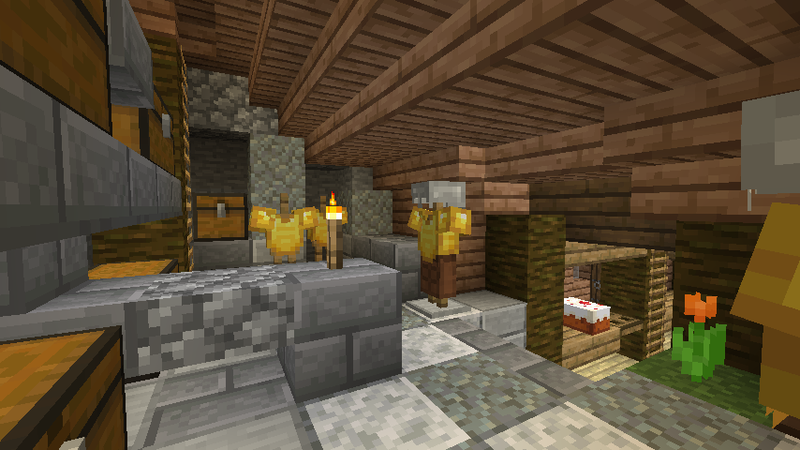 He smelts the ores into ingots in the furnace room to the right side of the entrance. The ingots are then shaped in the smithy on top of the platform outside which has chests and workbenches and a large open furnace apart from the one used by Esh. Underneath the smithy is a storage. This is where Esh hauls stones from the mine. Tul then smoothes and cuts bricks and other stonecrafts. Southwest of the large tree are two small circular huts which seem to have grown together. In fact the wall they share houses a furnace used by Dez to make pottery and clay brick works on one side and Gam to shape glass and sand on the other. In the potter's part the deep pond which lie underneath has been covered with a thick colored glass floor. Just north of the huts is a rectangular house open to the small lake west of it. Inside it works Bem dying sand, glass, concrete and textiles. He sleeps in a small room in the east part of the house. North of Ope's cabin is a grassy plain with some jungle and acacia trees. In a round stone hut lives Taw, a man who communicates with animals telepathically. South of the tree is the largest home of the valley. It has one exit to the north and two entrances to the south. Four people live in its two bedrooms. In the western room sleeps Vin and Azu. Vin designs the paths and gardens around the valley and advices any new construction. Azu draws maps and goes on journeys far away to bring back plant seeds from other biomes. She also explores old ruins for ancient curiosities and knowledge. In the eastern side sleeps Kam and Kin. Kam plants the food crops in the valley, from the carrots, beets, potatoes in along the shore of the large southern river inlet to wheat, pumpkins and melons growing along the small river snaking down from the north along the western side of the tree and the wizard's house. The crops are harvested by Kin and some are brought east to trade with the villagers in the desert. There are mixed feelings in the valley about this since the villagers have animals imprisoned to be bred and slaughtered for food and clothing. Up the mountain northwest of the tree is an icy dome where a strange elemental creature called Cis lives. Not much is known about it. More is known about the giant owl which speaks to Taw. 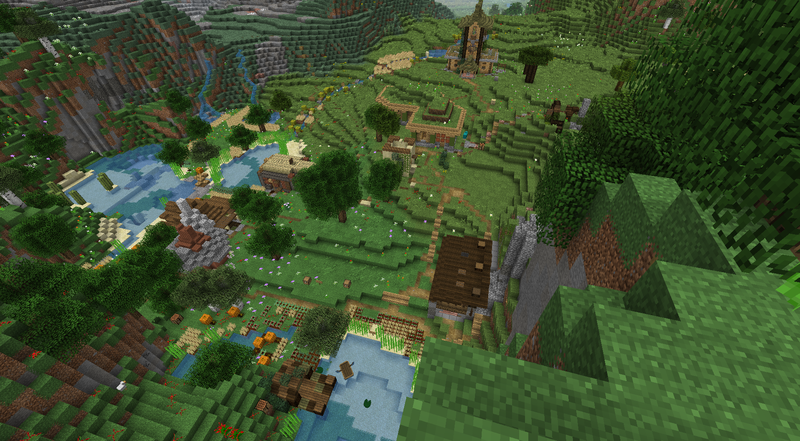 Connected both by road and an underground tunnel with Flower Valley the village is generated by the game engine, but will eventually be transformed as the world lore progresses. The villagers are in conflict with each other, unhappy and sick. They live mostly from animals kept in cruel conditions. Seven of the youngest villagers, Madu, Jasd, Aram, Taan, Dval, Naaj and Saar had enough and left. This first expansion is still under construction in a savanna just north of Flower Valley. Madu, Jasd, Aram, Taan, Dval, Naaj and Saar who left the desert village travelled to Flower Valley. While staying there the giant owl left the life tree to meet a mysterious stranger planting strange fruit in the Savanna in the north. The stranger with the same telepathic abilities as Taw told the owl that it would lead the construction of a new home for the desert people if all the Flower Valley inhabitants came along to assist them. After a meeting with the owl on the northeastern branch of the Life Tree everyone agreed to meet up north with the newcomer who revealed his named to be Avi. The answers to questions about his origin however left the questioners more puzzled than before. Instead he seemed very ardent on the task at hand. He made paired the newcomers from the village with workers of the valley giving them tasks. It seemed as if he already knew their talents. By occasionally switching the pairings the newcomers quickly all learned to mine, smelt, construct in wood and stone, craft magical devices, plant crops and harvest them. The difficult conditions of creating a permanent home in the area were greatly reduced thanks to the knowledge and advice brought by Avi. With a desert on the other side of the nearby river, the savanna suffered from seasonal droughts, but he designed a large water cistern in the cavern underneath the building to be filled during wet periods. Through a central pipe the water could be pumped to fill a bath on the ground floor, for irrigation of the crops grown on the terrace above and for cooking and drinking in the kitchen on the second floor. While constructing the house, the stranger also brought advanced technology in the form of a flying sunlight-powered droid and programmed it to gather fruits and nuts for the over twenty people involved in constructing the new home. Confident the flyer gazed across the landscape perched as it was on the biggest branch of Flower Valley’s Life Tree, next to the deep light blue crystal sonorizing any access of the oaken chest storing diamonds accumulated by Esh the legendary miner and gem cutter every day expanding and extending excavations mostly around the caverns and tunnels nesting further down than even the towering tree’s roots. Across the horizon from the northwest a sudden blinking light, a disc smooth as molten metal running across the sky suddenly stopping at the savanna heights. With eyes wide as the round doors of the underground dwelling of Azu, Vin, Kin and Kam without astonishment or awe but awakened curiosity the giant grey leans forth, extends wings with a drawn out wooosh, brushing and fanning in hundredfold aside to swoop up and away, ascending almost vertically as first and then embracing the warm air incoming to glide casting a shadow covering the narrow pass from the barren granite cliff to the sheep grazed oaky cone-shaped hill marking the natural border between valley inhabited and beyond. Increasing speed the usually nocturnal feathered fellow flies forward, focused on the flickering from ahead. Closing in, a funny figure climbs the rocks planting foreign fruits. Compelled to land they meet, one seven times as tall as the other. The stranger sings, no words but the meaning is of pure joy, yet so profound it seems to make the fruits grow, and that they do; in seconds only stalks swirl soaring, stretching sinewy strands, exploding in further fruit. With orange hair, a green cape, shirt and trousers, blue eyes and a silver necklace with jade heart the anonymous speaks “Fruits. Forget to remember”, takes a bit of purple white pulp in its mouth and is gone. Qal blinks, relaxes his shoulders. Images, yet blurry in his mind, appears of seven persons. Certainty is of their need — as he flies back to Flower Valley, it is time to assist the newcomers. In the trickle of dew accumulating along the vines stood the solemn figure tall, mesmerized by light playing among the leaves of the branches high under sky stricken pink and orange, with streams of gray-white clouds rolling and unfolding. For a moment all was still and then a sudden splash, a crack of a branch and the figure had leapt into the stream snaking its way across the dense jungle, occasionally widening to the size of a smaller lake. A fast swimmer, this figure with thick long dark brown hair and a blue green cloth wrapped around its torso quickly approached the border of the jungle opening up to a grassy plain strewn with daffodils, peonies and poppies. Carrying a bag of some sort, this tall woman with strong legs, now sprint over the hills, scattering wild horses and sheep as she pass them by, securely tracing a path only visible in her mind. In the horizon, behind four flowery hills rise an enormous tree, oak-like in shape but with gleaming colorful crystals among its branches. Below the hills a lake system lies with lily ponds and leaping fish. The woman also leaps, across a narrowing at least seven meters across, quickly continues up the slopes and into a crevasse of a cave. Not a natural one, or at least only partly so, this reeks of old ruin blended with something recent and fresh as if renovated. Meeting a man in a hood, a fleeting moment of words and the container exchanging hands. Wasting no time, the bare-feet woman trips up a spiral staircase into a large long hall with face-like illuminated formations for openings on each end and frescoes of landscapes in contrasting direct and reflected light respectively on opposite walls. Out of the hall, a balcony reveals the majestic tree in full, at least a hundred meters both tall and wide. Taking no heed to the scene, Azu outlines an overview of the day’s explored areas onto a map on the wall with colored charcoal. A valley opened up before them, full of flowers of all colors. In the middle a giant tree stretched its wide branches out in all directions, shadowing parts of the various small buildings underneath it. In the distant corner of the valley, small lakes gathered the water streaming down along the hillside. There was a waterfall from the upper part of the trunk of the giant tree, and another waterfall from the low mountains across the valley to the west. Plantations of grain and vegetables were scattered along the streams and lakes and around the mouth of the bay leading in between the steep cliffs covering the river to the south, leaving only a narrow peek towards distant grassy plains. North of the mammoth tree stood a 3-story building with a large green crystal on its roof. The first floor extended in two directions, creating balconies on both sides of the second . The roof of the third floor was deeply slanted. Next to the house was a well, which strangely had flickering light shining up from it. Up to the left, lay an overgrown wooden cabin, made from fallen tree trunks and up on the hill grass-covered mounds. It had small openings surrounded by old planks where light shone into the subterranean interior. A think trail of smoke ran from one of the holes in the roof. Latest download. Uploaded 2019-03-19. Consists of Flower Valley + Acacian Ascendancy as W.I.P. The coordinates to Flower Valley are XZ [260,570] while the spawn of the seed is at [-213,20]. Thus a trek of 725 blocks towards the southeast might be necessary when starting out and when dying without having another spawn set. Since XP is limited by playing on peaceful and without farms, the high level equipment available is just the bare minimum to get by for one player. Listed in spoilers below are what you hopefully find treasured within the Life Tree at the center of Flower Valley. The thread is recommended to be read from the beginning. If you don't want to browse and/or read all the thread posts I have created this list of titles linking to their corresponding posts in chronological order. What are those textures. They look vanilla but are they? In most journal entries I have used bDoubleO's resources pack. It has subtle alterations of the vanilla textures which I think improves material coherency and suits an organic build style. What shaders have you used? 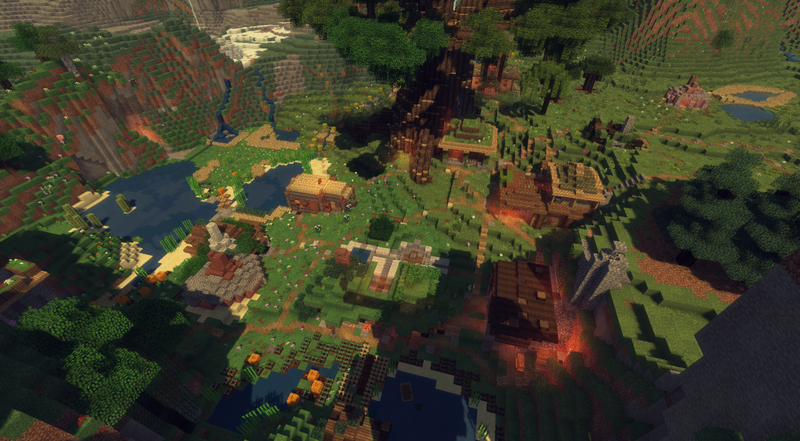 For some screenshots I've used Sonic Ether's shaders. Have you used some other graphical tool? Part of the core idea for the world was always care for and awareness of animals and nature. In practice this began as a guideline for building, to not alter biomes too much and as a rule by not creating animal holding pens or farms. Later, after the construction of the first buildings in the main area it expanded to not killing any animals, and after the beacon was obtained to encompass non-violence towards all mobs, hostile or friendly. Currently b³O is played in the peaceful difficulty setting where hostile mobs do not spawn. Items from animals and hostile mobs once killed in the past however are still kept in chests and as parts of crafted items. [journal entries + videos] Desert Village transformation — veganize the village green! To start off, I build a reception building (green), along with a small hut in sandstone where I sleep. I dug a mineshaft into the low mountainside, trying to make the entrance naturally looking, not just a hole in the ground. I also placed the nether portal into the mountain side (to the right in the picture), I will decorate and add some very nice feature to that area in the future. I tried to make the plantations for food a bit decorative and flow around the existing lakes instead of going for maximum space efficiency. I want to let this area grow naturally, without creating separating borders like hedges and fences between buildings. I think this will give it an overall more welcoming feel and beauty. I also tamed a horse (which I later named Death) to help me explore the surrounding areas. A nearby village in the desert to the east, where I will be trading the crops I harvest. Especially to get ender pearls, but also some tools. A mesa to gather terracotta in, great for building. You can see I already used some in the reception house! I also ventured into the nether and found a few treasures in a nether fortress. At this point, I have some diamond tools without enchantments, but upgrades will come as we go along and expand the area. Not much is planned yet, and the reception building houses all items and materials gathered. The chests in the reception building quickly got full with the basic minerals, so the subsequent build I create is dedicated to dirt, gravel, stone, granite, diorite and andesite, and located just next door. It is visible in the background to the left in the picture of posted below. I also made a cool kind of glass crystal on the roof to make the whole build pop a bit more. At this point I am partly living off bread and melons which you can see planted along a stream I dug from an upper small pond to connect with the two lakes in the lower part of the valley. I also built a small fishing shack, which I am somewhat reluctant to use, since I do my best to follow a vegan diet in real life. But I love buildings which are adjacent to water, and the temptations of level 30 enchanted books is strong! Luckily I get an amazing fishing rod, with Mending, Luck of the Sea III and Lure III, so I can catch many other things than fish! I also use it quite a lot to level up! At this point I am starting to think about what to do with all the wood, which is also cramming the reception building. I will post the solution in the next post, I hope you look forward to see what comes about! Love that glass crystal and seeing where this goes! I always like that style of building, integrating with the environment. Think of using more other shapes, incorporating some circular or oval elements - more "organic" than boxes. Or maybe some "distressed" buildings - with parts returning to the elements. Thanks for the comment leangreen76! Just checked out the thread with your world, so awesome to see how much you have accomplished by sticking with one world over the years! Keep it up, it is inspiring! Remember how in the last post I talked about lumber clogging up the reception house? The solution I came up was imagining myself as a forester coming there to help out and build a place for my activity. I wanted it to really blend into the landscape so I used some already fallen over large trees and then piled up other organic materials and stone around to make the walls. I used planks, perhaps also from the different wood recovered around the site, to hold up the roof. I then covered it with dirt and let it be overgrown by grass and other plants. The truth is that the interior and exterior grew up simultaneously. Taking on a role in this way made building process flow in a fun way!. Next I want to invite you to follow along for the interior. For storage, I placed one chest per wood type, which is enough for now. To make the row of single chests, I alternated with trapped chest, to avoid the creation of large double chests. This gave me plenty of storage for samplings, lumber, planks and other crafted wooden things specific to the different trees. I wanted a natural simple cozy and down to earth atmosphere, so I kept the floor partially dirt, and left holes here and there where you can peek outside. The bed I imagine is a loft bed or even a hanging mat. Next to it is the hearth the forester can use to keep warm and perhaps cook some food or warm water for a bath. The hearth has a small cobblestone chimney. The reception house is still clogged with items, so hang around for more updates! The greatest concern is all the ores. I also was not happy with how the stone storage turned out, so that will give a hint of what is to expect next! Smithy and stone mason + map! I had already had a dug long staircase down the level 10 strip mine and caves. So it felt natural to create some nice build for doing the smelting and crafting of iron at the exit. I wanted a way to include the stone and minerals as well. The entrance was a bit elevated, which gave me the idea of having two floors. Below is the stone mason, and on top the smithy. You can also see the forest plantation above on the hill, and a white horse I name 'Life' (in contrast with another black horse I named 'Death'. The horses are mostly just chilling around, Flower Valley is surrounded by plenty of rivers, lakes, forests and swamps, especially to the south and west, which makes riding less pleasant than it could be, and running is faster. Even if the north and east is more plain with desert and savanna, the sea has an inlet not too far away north. Most riding has hence been short trips to trade with the closest village in the desert to the east. The smithy has a cauldron which I imagine is used to temper the iron. It also has both the usual iron anvil and a stone anvil along with storage for crafted items and ingots. I separated the gold from the iron. So far I have mostly used gold for powered mine cart rails, while iron has gotten much more use, both decorative and functional. Behind the smithy is a large furnace with 8 furnace blocks integrated into it. I also used lava and magma blocks (I love those!) to add some more interest and realism. I even build a bellows on the side of the furnace, but unfortunately, I forgot that lava sets wood on fire, almost the whole smithy went up in blazes, and I had to replace all the wood, and make sure the distance from the lava blocks was enough. Behind the furnace is a storage room for coal and unprocessed ores. 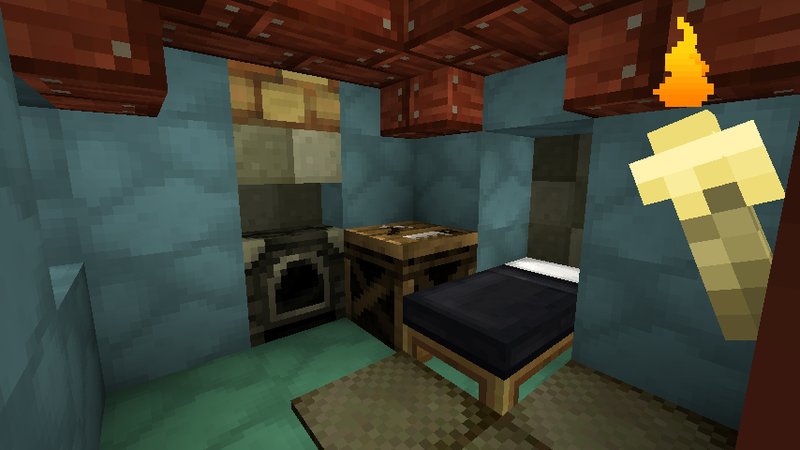 I also built bedrooms for the smith, miner and stone mason just to the left of the furnace room. I imagine they work in shifts, so they only got two beds to share =D These rooms are VERY plain, and I really want to work some more on making them more interesting! 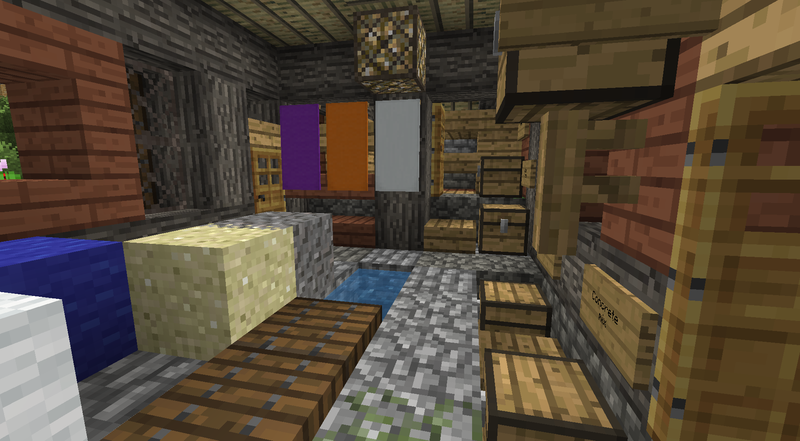 The stone mason below the smithy has slabs on which to work on, and plenty of chests for the various minerals. 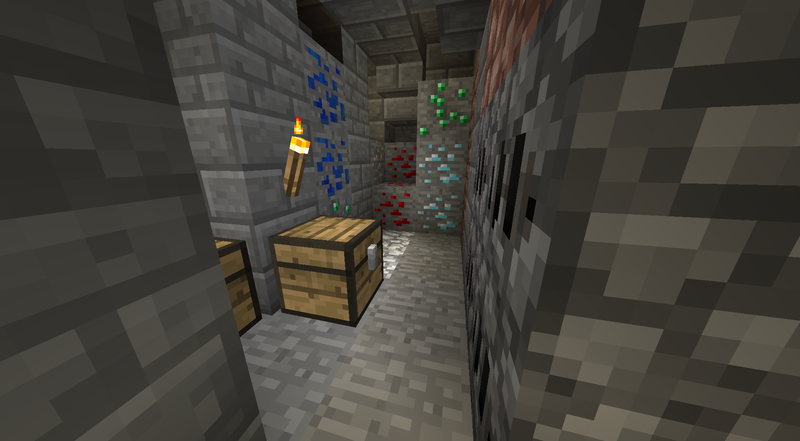 I 'color coded' the floor pattern to help indicate which chest stores andesite, granite, diorite and cobble stone. So now I can shove all my gathered ores and minerals in here when I come back from a caving or strip mining session. It is nothing like an automated smelter, but I like the atmosphere.the place provides! In the next update, I think I will show you three quite unique buildings. At least, I haven't seen them featured in ANY survival world. Each will have its own special purpose, both for crafting and storage. I am really looking forward to posting that update. Until then, I would love to hear your thoughts so far! Great job so far! Keep up the good work! Today I am sitting at the town library as usual lately (my "home internet" consists of a very unstable mobile-line a friend hi-jacked for me). I want to show three buildings which tie in together since they share the materials they work with: A potter, a glass worker and a dyer. I found the perfect spot for them next to one of the little lakes at the base of the valley. To save space and materials, I made the potter and glass worker share furnace. I built them on top of two small deep ponds. Instead of filling them in, I made the floor partly transparent, I think this is a cool feature! I left an opening in the wall to both workshops for a tree to peek in. This should help with ventilation as well, I can imagine it gets quite hot working melted glass, glazing terracotta, baking stoneware and firing bricks! Both of the buildings have beds for the workers to sleep in. I imagine they can use the work furnace for cooking any food they need. The dyer colors and provides colors for the creations of the potter and the glass worker as well as colors other materials such as wool and concrete. I started with a wooden frame of acacia wood, and then filled it in with both acacia and oak planks. I used hay bales to simulate a thatched roof. I figure the dyer needs a lot of water, so I chose a site next to the lakeside and let the water run into the building in two channels. In the back of the building I made a division with shelves and a door for a small Zen-inspired bed room. Much more to come! Can you spot where one of the next builds is going to be in the picture above? Some evidence of its first stages of preparation is visible to a keen observer.. It won't appear until after two more updates however! This will a bit of a shorter update. I built this but I am not sure I am too satisfied with the aesthetic part of this build. This a building provides visitors of the valley with food in an open kitchen, which has a separate entrance. It also provides the more complex crafted items, which are crafted on the roof of the building, and then displayed and stored below. As you enter, you find clocks, compasses, saddles, torches and other equipment. 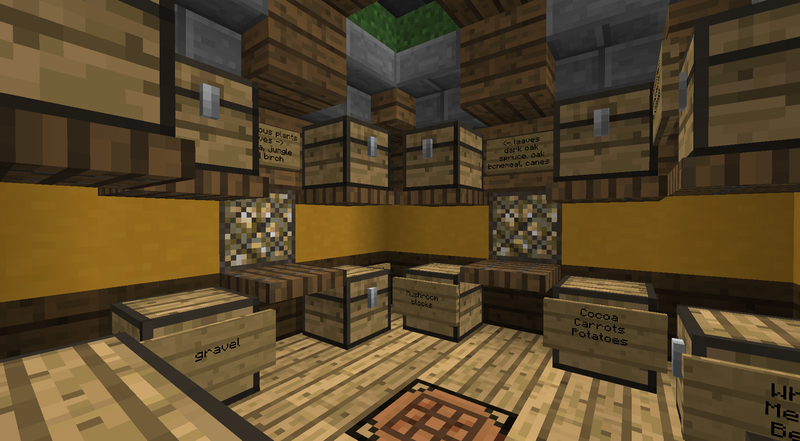 In the back of the building is a large room which stores the more 'builky' items: beds, chests and so forth. 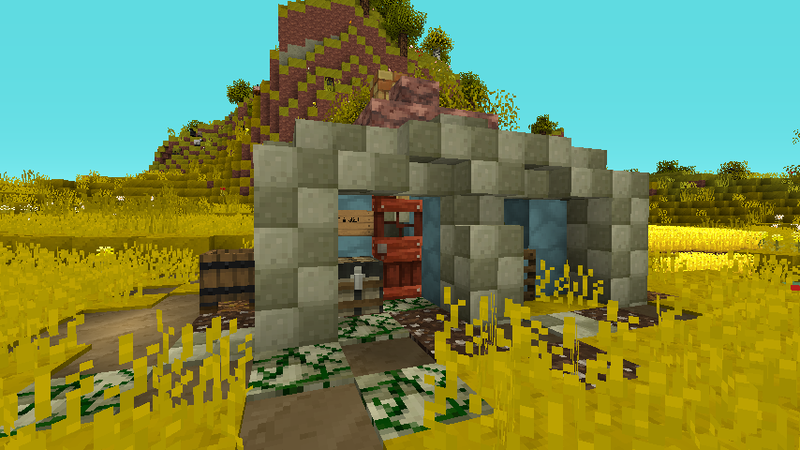 I built this where I previously had the first storage for stones and minerals. It is just next to the reception building, and below the forester's cabin (which you can spot just in the upper left corner of the first screenshot. I like using jungle wood, which has this green organic feel to it in the texture pack I am using, but the build itself is very square and I feel it lacks something, like a harmony or flow. But I also want it to be rickety, so perhaps just some minor adjustments are necessary. What do you think? Any suggestions for improvements? I feel like there are too many block types in play ... people sometimes recommend 3 textures in a building - 2 similar and one contrasting. Also you could build larger, this would help making curves. I did some simple changes with your advice as guidelines. I reduced the number of wool colors to two, and instead of stripes, a less strict outline. 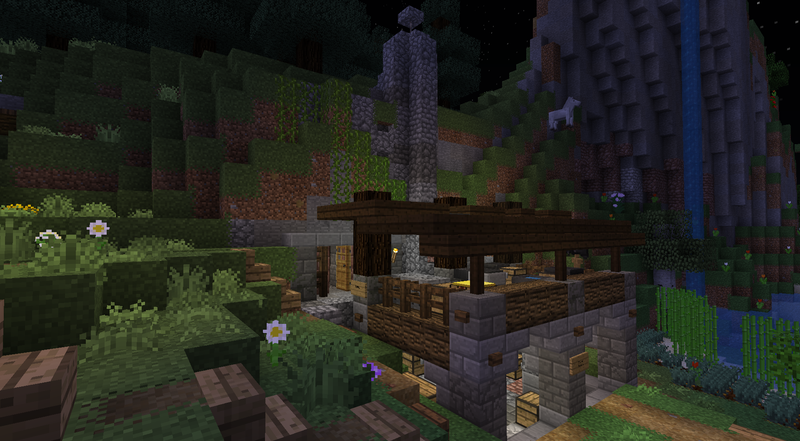 In the top roof, I removed the spruce wood, keeping it to jungle and oak only. I made the roofs slightly larger while adding more shape, a bit more circular, curvy along the edges and higher tops. I really think this helped. I also cleared out some land to the left of the building, which made the fence gate in the poles connect. Before I felt the building was too square and busy, now I feel it is at least more relaxing to look at, even if it is far from an architectural masterpiece. Thanks to everyone reading and posting so far! I want to include all of you somehow in a future build (some plans have already been made...)! I wanted a place to store wool and also food for breeding animals. Since all animals in Flower Valley are roaming however they please, and none of them are used against their will, I imagined a person I would like to call an 'animalist', someone with a amiable telepathic connection with animals managing any resources.obtained from them. For the building, I used mostly terracotta and cobblestone. It has one small room furnished with a bed for the animalist to sleep and a furnace for heating, warming water and cooking. I think the shapes of the exterior turned out pretty cool, they are a dwarven-inspired. 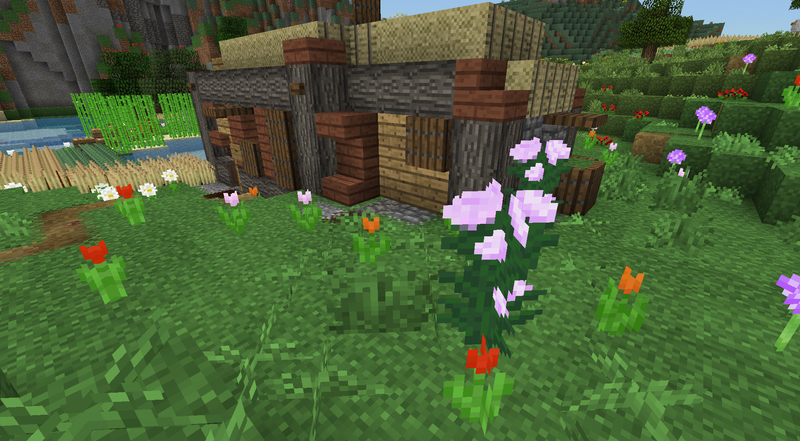 Then yesterday I watched some generikb on YouTube and got inspired to try the texture pack he used. I really love how the building looks in it, so I wanted to share that and included pictures for you to compare, I especially like the interiors - the exteriors are perhaps a bit too yellow. But interior-wise, there is something about the color and also the nails in the wooden boards that appeals a lot to me. Let me know which texture pack you prefer me posting in. Perhaps you have some other one you would like me to try as well? Special thanks to grey sheep for posing in the third picture! In the surroundings I some wheat fields around the lakes that were already there. I brought over sheep and colored them in all the 16 available colors. They mostly sit up on the pointy mountain you can see in the background. There are llamas chilling in the extreme hills just to the west, which might feature in a coming update. Other animals in Flower Valley besides two horses I have named (Life & Death) are some pigs along the river and a parrot who lives in the Wizard's house. After that I will intermingle the building posts with some journals while exploring outside the valley, i think that will give some needed variation to this thread. This is very good advice. I would also suggest building larger. If you're interested in building techniques, this thread has been the most impactful for me personally. It is from the Alpha, so I'm not sure everything is applicable, but it gives strong foundations of building theory. It covers a pretty wide range range of topics, from the basics to things a little more advanced. There's info on golden ratios, midpoints, the use of trim, etc. If you really want challenge yourself, it has a little bit on angled perspective(something I still can't do), or if you want to do some math it even tells you how to make parabolas. Also, if you want to make curves, I suggest using these. 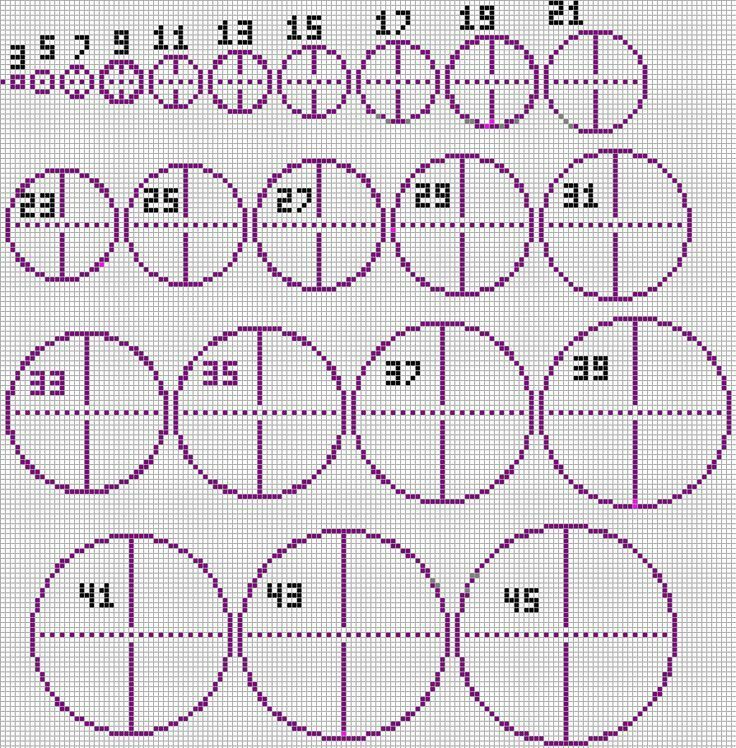 You can cut the circles into quarters/halves for better integration into a building or to make more interesting curves than a plain circle. Great job so far though. My only real suggestion would be, never use glass for flooring. Like ever. The only appropriate time to use glass flooring IMO is if you're using it on an elevated platform and need the clear floor so you can look down at something. TheWesson and I are in complete agreement on this thread however. This forum has made me decide that I now want kids, so that when they get old enough, I can forbid them from coming here. it's a terrible place. The BEST way to mine diamond, layer 12 and you. I love to collect good resources and advice, in fact I keep a so called 'commonplace book' in Microsoft OneNote, where one notebook entirely devoted to Minecraft, a practice I can recommend to anyone (it doesn't have to be in that particular software, it can be as folders with images, or bookmarks in a web-browser). I have different sections for the projects (my creative and survival world), as well as for build ideas and technical details. Writing things down with one's own words however can be a good way to see to that the information has been been integrated fully. Then the most important step is of course to apply it, I look forward to trying to use more golden ratios, and even parabolas in future builds, few feelings beat the one you get when you know you are improving and mastering new things! I would beg to differ on the use of glass in this particular case, since it was done with the both to preserve a natural feature and to accentuate the part of the purpose of the buildings, which is to make glass. But as a general rule, I think it makes sense. I think there should always be room for the artist within us who needs to break rules, when certain inspiration hits. Anyway, I think the next build I am about to post has used glass in a better fashion, I hope you will agree. My desire to build in a living relation to nature has a long history in my life. Some of the books I fell in love with at an early age was the Lord of the Rings, which I am sure most people are familiar with after the success of the movies. What especially appealed to me in these books were the lengthy detail and language used to describe nature and the environment, and how alive and immersed I became when reading these parts. Today's post is inspired from these stories, since it is a partly submerged building akin to the style of hobbit homes. These would reside in a common building dug into the hillside between the stonemason and the potter. In this build I really want to create a greater depth of the exterior than I my previous builds. I also want to use different interior wall materials from the outer ones. 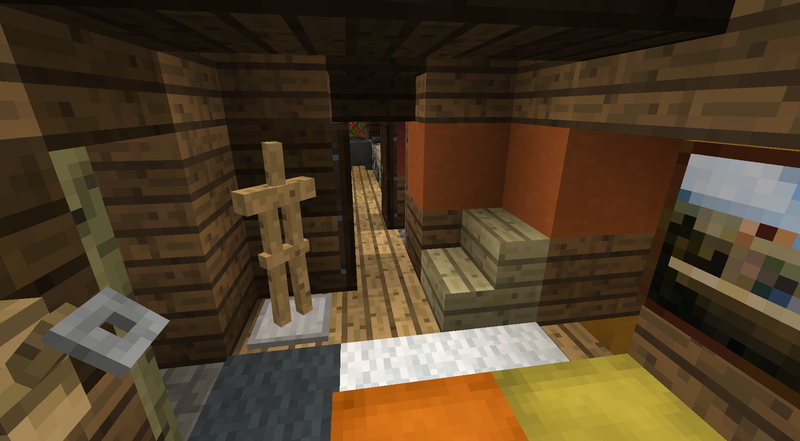 I use mostly of terracotta for the inner rooms, mixed with spruce and dark oak wood for the outer rooms as well as for wooden panels which I think are essential for a more cozy hobbit feel. Without them, the rooms would feel to sparse and perhaps even modern. I place building materials in chests at the site before starting the work, as shown in the last image in this post. To start I dig out the rooms and lay out the floors. Cobblestone as wall support both add to realism and helps visualize how the walls would connect best. Where the temporary bed is, the kitchen. From the kitchen, a corridor follows parallel to the exterior to the bedroom of the grower and harvester, which also has a door to the outside. In between these, I later add a small closet for storing equipment, to fully utilize the space available. From the kitchen, another passage leads down to the bedroom of the landscaper and the herbalist. That passage continues to a staircase and a back exit .Both bedrooms are connected to a common storage room, which is partly hidden behind dirt in the middle of the picture above. Next I build up the walls, alternating with both the exterior and the interior. After all the walls are built, I proceed to create the ceilings, trying to make as realistic as possible a wooden support structure, which I then cover in dirt (covering everything up in dirt is somehow extremely satisfactory!). It is important that the dirt roof has proper support, hence I have ubiquitously made use of trapdoors and also placed the fence-posts on andesite and other stone blocks. A magma block is a simple way of giving the impression of a fireplace with smoldering coal. To make the resulting hill more interesting, I lay out a small park on top, including a pond which serves as a skylight for the bedroom of the herbalist's and landscaper's bedroom. I think this feature turns out really well! This park could be improved, but I am very pleased with the overgrown chimney and the pond! The glass block has benches around it and is precisely above the middle of the storage room, giving it some access to daylight. I am not entirely satisfied by the sign placements in this room, I would prefer something more coherent. The way the chests are placed prevent the use of item frames or signs in front of all of them. I want to redesign this at a later point. But I like the general symmetry, the colors, lighting and ceiling pattern (not visibile) as well as the crafting table in the floor. While building the closet, I was disturbed by groaning mobs, so I dug down a bit and discovered a cave system underneath! I decided to keep this as a fun feature, so the closet has a hidden staircase down to the case under the trapdoors to the left! I hope this lengthy showcase of my thoughts and the process while constructing this building can inspire and gives some new ideas for interior and exterior decoration. Any suggestions for improvements are also warmly welcomed! Wow! More great progress! I love it! Flower Valley's looking pretty nice. The pond/skylight IS kinda cool. You can use portions of ovals/circles. After a while you start to get used to eyeballing them.